CIMCO MDC-Max comes with support for controlling Tower Stack lights, Beacons, sound alarms and other signaling units that can be used for visual and audible feedback of machine state. MDC-Max has a flexible approach to configuring and controlling signaling units. 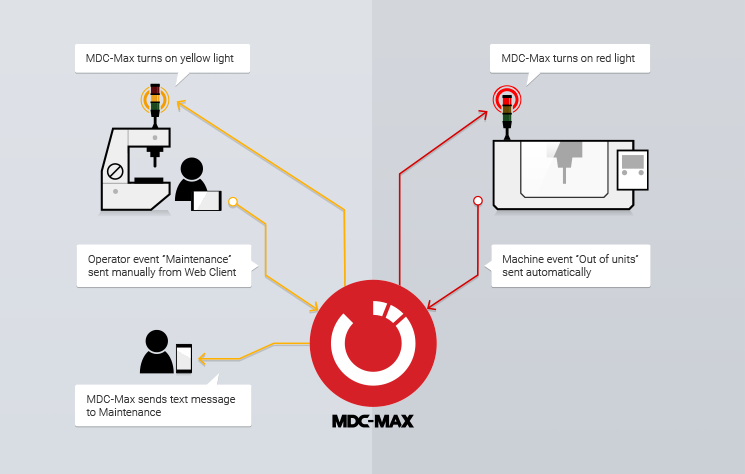 Status events can be sent automatically from machines or manually by Operators using the MDC-Max Web Client. In MDC-Max, events can be configured to turn on/off specific colors on a stack light or trigger a sound alarm. Mutliple machines can even control a shared stack light or other signaling unit. A manual drill is out of coolant. The Operator presses the “Materials” button on the MDC-Max Operator screen running on a mounted tablet. The event is received by MDC-Max in an instant and the yellow color on the machine’s stack light is turned on. Further, a text message (SMS notification) is sent automatically to Maintenance for coolant refill. A CNC machine is out of units to process. The machine automatically sends an event to MDC-Max that turns on the red color on the machine’s stack light. A Supervisor or Operator quickly notice the red light, checks the machine and calls for production planning.